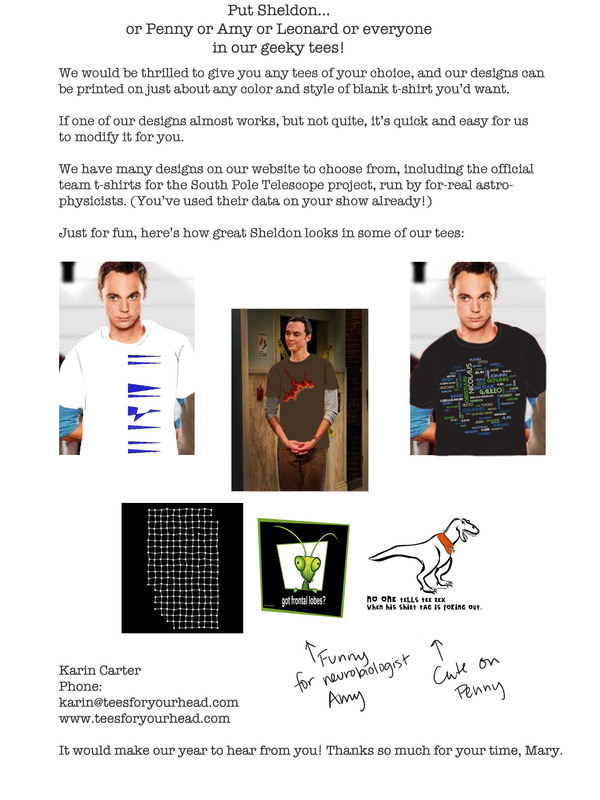 The Big Bang Theory and Other Geek Celebrities: Do You Know Someone Who Knows Someone? If you’ve ever watched an episode of The Big Bang Theory, you know that Sheldon, a physicist working on string theory, always wears interesting t-shirts. We think he would look very groovy wearing a Tees For Your Head t-shirt! Heck, let’s put any cast member in one of our t-shirts. A cute T Rex t-shirt on Kaley? So here’s where you come in: are you separated by six degrees from Kevin Bacon? No, wait, I mean, do you know Mayim Bialik? (Now there’s an attractive woman made to look not-so-hot, like Charlize Theron in Monster. Yikes.) Or Kaley Cuoco? Anyone? Anyone? (Just can’t stop referring to other movies.) Of course, if you know the wardrobe people who dress the actors, that would be the best thing ever. Or maybe you are a childhood friend or the next door neighbor of the awesome Neil deGrasse Tyson? You know he’s an astrophysicist, so that makes for one attractive guy right there. I’d send him our Astronomers t-shirt if I knew what size he wears. (Hint, hint.) Then the next job would be to catch a photo of him wearing it. Bill Nye? He gets his own paragraph and needs no explanation. Jade Raymond, Kari Byron, Danica McKellar, Katee Sackhoff, Morgan Webb, Tina Fey, Marina Orlova, Dexter Holland, Kate Beckinsale, Kevin Grevioux, Adrianne Curry, Wil Wheaton, Dylan Bruno, Masi Oka, Drake Hogestyn, Lisa Kudrow, Ally Walker, Dan Grimaldi, Rowan Atkinson, Tom Hanks, Terrence Howard, Dolph Lundgren, Trent Reznor, Brian May, Tom Lehrer, Sandra Tsing Loh, Normal Mailer, Montel Williams. Whew. I commend you if you read the whole list. Most of it’s from an article on Computerworld, and it’s highly entertaining to see what these actors and other people can really do. Brian May, guitarist for Queen and PhD in astrophysics? Now that’s a seriously nerdy guy. We’re looking for brainiacs of any stripe, whether science, tech, or the arts. Are you someone who’d wear our shirt and let us talk about it? Contact me! Oh, or how about your adorable children in geekwear? We could even print some special onesies or tiny sizes, and as you may know, we can fit everyone from toddler 2T to adult 4XL. That should about cover (ha ha) everyone. So who do you know? And thank you!